I read an interesting NY Times article yesterday about the efforts by Senators Mark Warner of Virginia and Saxy Chambliss of Georgia to create a bipartisan conversation about the nation’s budget deficit. This as Congress makes a grand show of nipping at the budget’s heels by cutting things like Head Start early education for children. I’d like to encourage you to join with Senators Chambliss and Warner in their effort to hold an honest, bipartisan dialogue about our national deficit. The current talk in Congress focuses on cutting discretionary spending, which only makes up 12% of our budget. Much of it goes to important programs, but even if we cut it all, we still would have a long way to go to fix the deficit. I’d like you to be a part of an honest discussion that acknowledges that cuts in spending will have to include defense, healthcare, and social security costs. I’d also like you to acknowledge that revenue increases will also be a necessary part of the solution. Please stop playing politics with our nation’s future. Join Senators Chambliss and Warner and others who will rise above politics and find a bipartisan solution to repair our nation’s finances. That’s the action I’m taking. What action will you take? 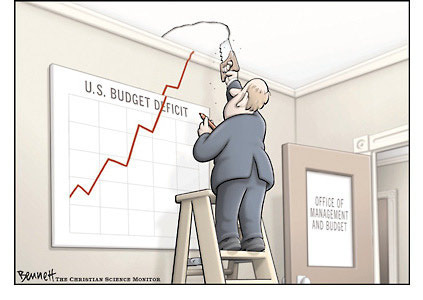 How do you think the deficit should be approached? In other news, I’m heading out this morning on an overnight border run to Singapore (previous entry). Figured that the flight is the same price if I stay overnight, I’ll have time for dinner with friends, and I don’t have to get up so early to catch my flight. Except that I went to bed early and managed to have the garbage collectors wake me up at 4:30 as they rattled the bins on the street. Thankfully, this trip will include lunch at Din Tai Fung with two other Xangans. This entry was posted in Uncategorized and tagged america, Budget, deficit, government, politics, United States, USA by christao408. Bookmark the permalink. Have a safe trip Chris – even though they are so routine by now. Btw who are the Xangans in SG? I have sent a letter to my senators! I get more and more upset by our new governor who wants to cut the budget by cutting funds to education, health concerns for the elderly. Of course they are the people who cannot afford to spend money or contribute to campaigns. Oh, he also wants to give tax breaks to big business. I don’t have a senator or congressperson anymore I am hopeful that Congress will get serious at looking at cuts that may not make them the most popular politicians but will really make a dent in the deficit. Hope the trip is very refreshing and relaxing. AND, I hope you really don’t have to do these border runs for much longer Chris. What a pain! Yeah have fun in Singapore. @AzureRecollections – Sure enough. In fact, I’ve made a video about previous Singapore border runs. @vsan79 – Surely did.